Meghan Melnyk has become a well-known name, not only on the Mount Royal University campus but also across Canada. 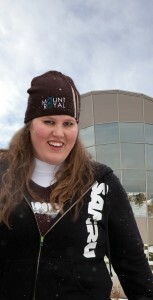 Melnyk, the former President of the Student Association of Mount Royal University (SAMRU), has been sentenced for a bank robbery she committed in 2012. The ex-president is said to have accepted her fate while the judge sentenced her to 18 months and three years of probation to follow. At her last hearing, Melnyk was remorseful as she told the court that she regretted her actions. Melnyk’s defence attorney Toni Roulston urged the court to consider a less severe punishment such as a conditional sentence, to be served in the community — so that Melnyk could receive proper counseling for her actions. Roulston also suggested 90 days in jail to be served on weekends with a long probation period. However, Judge Anne Brown of the Provincial Court saw reason for Melnyk to face more severe consequences for her actions. Judge Brown also sentenced Melnyk with 240 community service hours to be completed within the first 18 months of her probation, as well as mandatory counseling in the areas of gambling addictions, self-esteem, impulsivity, financial budgeting and career counseling. Although the typical ruling for a bank robbery starts at four years, Crown prosecutor Ken McCaffrey agreed with Judge Brown’s verdict. The association issued a release in January of 2012 saying she had resigned from the position for personal reasons. Melnyk had previously resigned from her position as SAMRU president in Jan. 2012, after “financial anomalies” were found during her performance review. On Feb. 29, 2012, Melnyk committed the robbery at the Servus Credit Union in the 5300 block of 68 Avenue S.E., demanding cash with a note that read that she was armed. Police arrested Melnyk later that day, after bank attendants recorded her licence plate number and called 911. In Aug. 2012, Melnyk pleaded guilty and was released on bail. The case was revisited June 17 when Melnyk faced her court hearing; however, the judge decided to revise decision and postpone it until Sept. 2013.